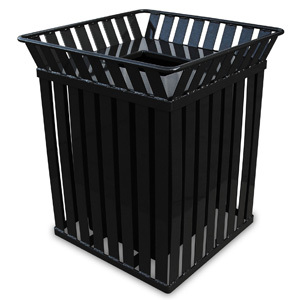 Square shaped trash receptacle with flat top pitch in lid will provide a contemporary look while encouraging a litter free environment. Constructed for durability from 2" x 1/8" galvanized steel slats finished with a polyester powder-coat, primed with a zinc rich primer. Built-In stainless steel leveling feet to ensure the receptacle will stay level on almost any terrain. Models are available in the color options as shown. Lift-Off Lid for Easy Access. Black High Density Rigid Poly Liner. Built-In Stainless Steel Leveling Feet.